Very diverse terrain with streams, wetlands, steep slopes, ridges and a diverse plant community. Situated between the Sparta Mountain Wildlife Area and Pequannock Watershed, this area supports a mixed hemlock-hardwood forest and wildlife habitat. The Russia Brook Sanctuary is part of more than 1,000 acres acquired by the Passaic River Coalition Land Trust. Use Contact Information on this site for additional information about the significant efforts of this organization to preserve and defend the Passaic River watershed. 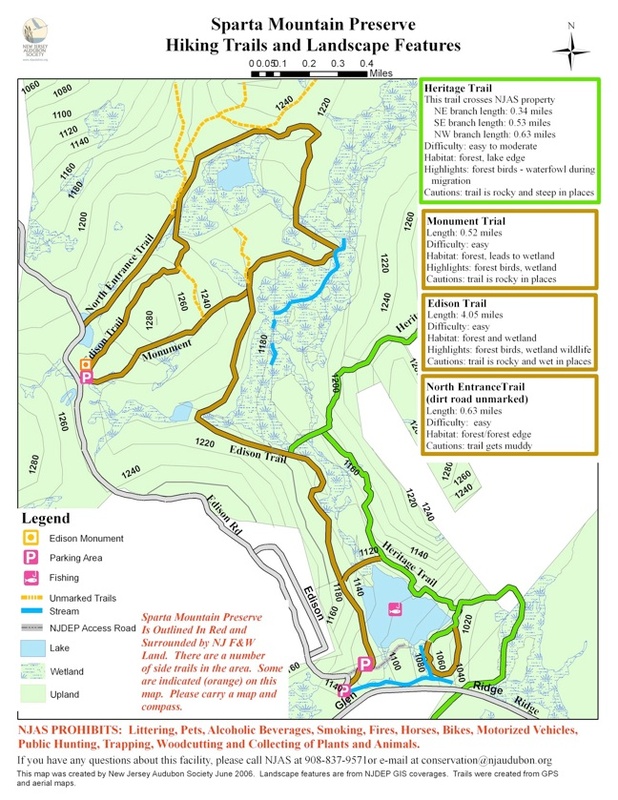 Use the Web Map link on this site to view a trail map of Sparta Mountain WMA. It shows the "Heritage Trail" (green blaze) bending towards Russia Brook Sanctuary (which is not identified on this map). Click to view photographs from a hike taken in the combined parklands. From US 80, exit at Route 15, travel north 8.2 miles to Sparta/Lake Mohawk Exit [Route 181] on right. Take 181 North 1.2 miles; take a right onto East Mountain Road. Follow it for 1.3 miles and turn right onto Glen Road [Route 620 East]. Take Glen Road 3.7 miles and take a left onto Edison Road. Entrance to Ryker Lake is 0.2 mile on your right. From 287/23 Interchange, take Route 23 north 9.6 miles and take right jug-handle to Oak ridge Road exit. Continue through light on Oak Ridge Road and drive 3.1 miles. Take a right [past a gas station] onto Ridge Road. Take Ridge Road 2.8 miles and take a right onto Edison Road. Entrance to Ryker Lake is 0.2 mile on your right. The "Directions" tab on this web site provides a GPS central location for the Sanctuary (but not driving directions leading to a parking area).